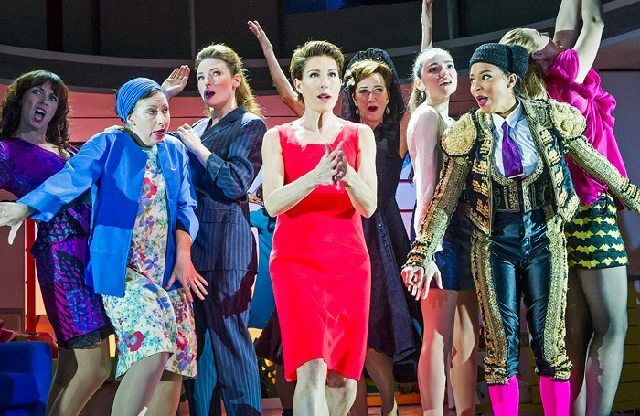 I was totally gutted that I couldn’t see Woman On The Verge of a Nervous Breakdown when it opened in December; a planned Christmas holiday and a lot of theatrical busyness has kept me at bay since. Aside from empathising with the title of the show, I am pretty much able to recite each episode of Black Books word for word, so yeah, I am a pretty big fan of Tamsin Greig, who for me was the star attraction of this show. Based on Pedro Almodóvar’s film of the same name, Women On The Verge is set in 1980’s Madrid and explores the frantic love lives of several woman including the central character, Pepa (played by Greig), a 42 year old who has recently been abandoned by her lover, Ivan. Anna Skellern provided a great deal of contrasting comedy as the hopeless Candela, who has neither the strength nor vitriol of Pepa and Lucia, but instead finds herself hopelessly stumped by her own naivety. Furthermore, Skellern made a fantastic entrance as Candela amid the genuinely hilarious “Model Behaviour” montage. Funny as it was and pacey as it started to be, I am not thoroughly convinced that musical numbers work amid the traditional farce format, or if they do, then the songs in this show certainly didn’t do it any justice. Other than “invisible” and something about being “On The Verge,” I couldn’t hum any tunes from the show. Bad sign. This particular production didn’t seem to have a great deal of stylistic direction. By that I do not mean set or costumes because the show LOOKED great. Instead I mean the style of performance seemed somewhat confused; at times there appeared to be a fourth wall and at times there did not. Sometimes actors sat aside the stage watching the action and at times scenes were set without these weird moments of voyeurism. I am not sure what director Bartlett Sher was going for here and generally felt some scenes were a bit of a mad and unnecessary jumble. Okay, bugbear, what on earth was the strange matador type character up to, why was she wearing offensively pink tights with a princess layer hair hat and just generally creeping about? Was this a vague attempt as some legitimate Spanish-ness? I just found it a bit TOO strange. Speaking of Spanishness, another bugbear was the contrasting accents. The show is set in Spain and, going by their names, the characters were all Spanish too, so why did only a few characters have a Spanish accent? I understand that this was perhaps to give a little flavour of the setting but for me this was a weird juxtaposition. I am not sure I have ever felt quite so conflicted about a production; at times I loved it at times I felt deeply annoyed by it. One thing is for sure though, the cast were brilliant. It is worth seeing the show just for them.